I know that I tell you a lot of sad and upsetting things about Guatemala. But to tell you the truth, I LOVE it here! That's probably also why I get so angry when I realize how much inequality and violence that marks this country. So, to show you some beautiful sides of Guatemala, please follow the link bellow, and you'll hopefully understand my love. There are many ways for a man to control his woman. The best way to do it is to make sure she's dependent on you. Economically. As long as you've got a job you'll just tell her to stay home, that you don't want her to work, since that would be a disgrace to you. If you really want to make sure she doesn't leave the house while you're at work just make her pregnant. Since you're the head of the house and also the one with the sexual needs (women are just there to please the man, right?) you decide when it's time to make another baby. If your woman, by any chance, would tell you that she wants to leave the house (sometimes she actually needs to go out to the market to buy you food, or go to the doctor with one of your kids), make sure she tells you when she'll get back. And if she doesn't get back on time, or if you see her talking to another man in the streets, or if she doesn't serve you food on time, or if she doesn't get the baby to stop crying or, just imagine, if she doesn't want to please you sexually whenever you fell like it, you're allowed to punish her. And then you can go home to one of your lovers (who still thinks you're divorced, waiting your second baby) to get some affection and support. 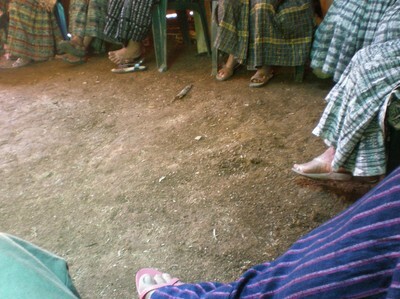 Guatemala is far from just violence and controlling men. The Guatemalan culture is so much more than machismo. But the violence is a part of the reality here and machismo, as bad as it gets, still is a more or less accepted part of the society. There are wonderful, caring fathers and husbands, there are organisations fighting for the women's rights. There are laws about the women's rights as well, but there is no functioning judicial system making sure that those laws are followed. If you go to the police and tell them that your husband treats you bad, probably nothing would happen. And if it did, or if you as a woman decided to leave your husband, who would take care of you then? Who would pay for your kids food, shelter and education? Maybe it's easier after all, just to do as you are told, in that way you might not end up in trouble. Up in the highlands almost everyone are farmers, pretty poor and Mayan. 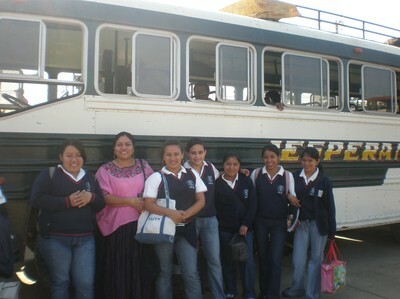 Many of the poorest people doesn't even speak Spanish, but instead one of 23 Mayan-languages. 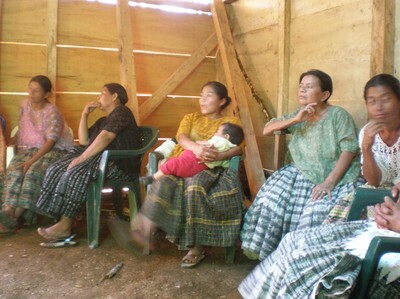 In and around Cobán, Quek'chi is the most common language. One woman told me that in many Mayan families Spanish is considered "the language of the ladinos" (the ones with some Spanish blood in their veins...) and therefore many parents don't want their kids to learn it. Unfortunately Spanish is also the language of power here, and if you can't speak Spanish you'll get problems as soon as you want to study, needs to go to the hospital and so on. Today I've been surrounded of the Quek'chi language. And a lot of smiling, laughing women pointing at me saying things I couldn't understand at all. 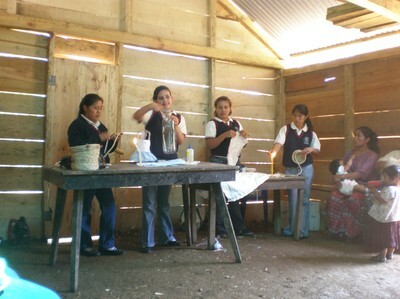 I was invited to join a small group of students up to a highland-community to teach the women there how to make alternative handicrafts, so that they will be able to sell more. Well, I didn't teach anyone anything, but I was the centre of attraction (again...), that's for sure. It was a great trip, and I'll let the pictures tell you the rest. Enjoy! On our way home again, this time in 'micro'. Yes, I enjoy my self here in Guatemala. Yes, the sun is shining some of the days, making me drink water as never before. But other days it will be rainy and those days I'm really happy to have my dear dear hoodie. And no, it's not just lazy days, I started to do my first interviews allready last week. Wake up (not to early though, I need even more sleep here than in Sweden...). 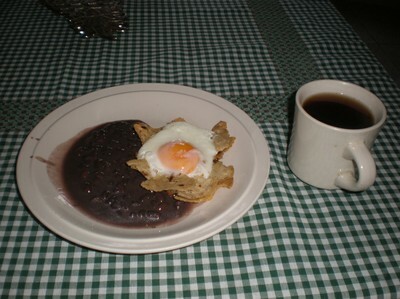 Rosa makes me breakfast (eggs, beans and tortilla with sugar-coffee, but you allready know that). I go down to the plaza (I'll soon publish a picture, it looks like a giant church, with McDonalds just outside the entrance). From there I take a micro (the one where the boy leans out through the window shouting: tactictactictactiiiiic, you know...), about forty minutes ride. In Tactic I go visit Alfonso, the best spanish-teacher ever, and my guide through the Guatemalan society and culture. He's also the one introducing me to all my informants, the single-mothers. Then I go out, to visit one or two women. I bring my pen and paper and recorder and I never know for how long I'll be there. After the interviews I take another micro back (this time: cobancobancobaaaaaan...). I might have to run some errands in town trying to think about something else than my fieldwork. Back at home I sit down by my computer to try to sum up all the new things I've got to know during my interviews. Some more time to work and then time to sleep. Today I had an interview with a 28 year old woman with three kids. Yesterday I talked to a 22 year old woman who's got a four year old son. When I came home today I was almost boiling. THOSE MEN!!! I was first aiming to dedicate this text to the phenomena machismo. But no, not today. I'm still to upset to write about the way of the men. I want to be able to sleep tonight and not upset my self to much now when I just managed to calm my self down. But I'll tell you all about it. Another day. Today I bought my self a jump rope. It's red and blue striped and it has got very nice handles of wood. You might ask WHY I would go buy a jump rope when I'm in Guatemala. Well, to do some daily jumping I would say. The fact is that I haven't really used such a thing for many years now. But I recall it to be quite joyfull (memories from my childhood) and if I'd ask my brother I guess he still has got one or two for work out. Trying to give you the whole picture: I'm in Guatemala. For breakfast I eat beans, eggs and tortilla. For lunch I get pasta or rice. For dinner I eat rice, sometimes beans, and tortilla. Sometimes I get a potato as well. All those carbohydrates in combination with me sitting by the computer writing or sitting down reading (yes I actually study a lot here...) makes me feel very restless. So, go out running you might say. Well, the problem is, I'm still in Guatemala. In a city where you wouldn't want to spend to much time in the center because of all the traffic and pollution. I try not to walk to the center more than once a day either, actually because I get tired of being the centre of attraction, always having people stairing at me, shouting after me. And I allready walk faster than everyone else here, even if I'm trying to do my SLOW WALK! So how would it look like if I came running down the street? Nope. 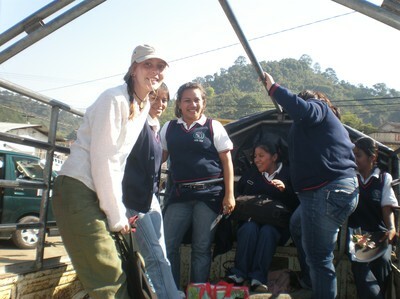 To be able to go through with my project here in Guatemala I have to travel some. I guess I will make some longer tours to the capital to get some specific information or meet people who work there. I will probably also do a few trips to the more touristic places in this beautiful country to get a bit of change and vacation. But the kind of trips I will have to do the most is between the small city of Cobán where I live and the market town of Tactic where I will conduct the main part of my study. I've already been there three times this week and it's always the same feeling of reality that hits me when I get on the 'micro' (those smaller busses, normally with seats for about twelve persons) outside the big shopping mall. The radio is playing bachata, cumbia or reggaeton and sometimes a former american song, now with spanish lyrics. First time I went to Tactic this week we were twentyfour persons in the buss, plus the driver and some chicken in a fabric bag. The trip takes about forty minutes and I was half sitting, half standing in the front, holding on to the roof as good as I could so that I wouldn't cruch the small girl sitting next to me. 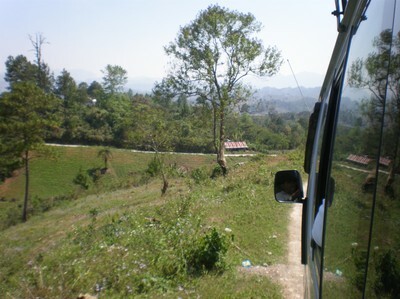 The road is full of bends and surrounded by a beautiful green landscape with high hills and steep slopes. "Sometimes one is lucky" I think for my self when our driver makes a crazy overtaking just before a sharp bend. We pass the 24-hours hotels where the young (and older) lovers meet to keep away from their family (sometimes from mum and dad, sometimes from whife and children). We pass the men walking on the side of the road with their big piles of wood on their back. One man could afford a bike on which he now transports all the wood, trying to bike at the same time. We pass the women in their beautiful traditional skirts and huipiles (google it! ), carrying children on their backs and big baskets on their heads. The young man who's been hanging out through the window shouting out his "tactictactictactiiiiiic" everytime we pass people on the road, trying to get even more people on the allready overcrowded bus, now turns to us and ask for 'el pasaje', the payment. He charges everyone, except from the poor chickens in the bag, 6 Quetzales which is about 2/3 of a US Dollar. But it doesn't matter much that we all squeeze in, almost sitting in each others laps, in the small bus. Everyone is in the same situation and almost everyone has a friendly smile in their face showing that "I'm not dangerous, you can sit even closer if you want to". I think I will never stop being amazed about the friendliness and nice smiles I meet here. And the helpfulness and will to share. Even if there are many bad things happening in this country, even if the people here have been put through a lot of suffering the latest decades (the about thirty year long civil war ended 1996, and after that came the drugs...) most of the people still meet you, but also each other, with a lot of friendliness and respect. Wow! My head is spinning! I met my first informant today, a single mother with three small kids, living on her own without electricity, without an income, trying to get her kids to be able to study. I'm sure you'll hear more about her and other mothers later. I've also been seing some old and some new friends those days and my head is a chaos of names and places and things to remember. But today I just felt I have to inform you about the worst thing happening in Guatemala right now. El narcotrafico, the huge deal with drugs getting smuggled over the boarders here. 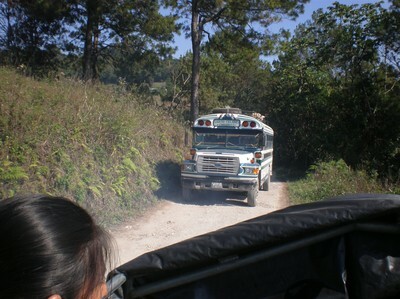 I stay in Cobán now, and I aim to visit Tactic a lot, a village situated about forty minutes south from Cobán. Both those places are on the way north through the country, on the only real road through this part. That means it's also located "en el camino de las drogas", in the way where a lot of drugtrafic now passes. The smugglers in Mexico has discovered Guatemala as a good place to land their small planes in secret, and to transport their gods across borders that are more or less unguarded. Guatemala, and especially Alta Verapaz where I stay, has become the new port for the Mexican bands to reach out to the United States and the world with their drugs. Out to the world where you are. Out to the world where the money is. Both in Tactic and Cobán people now tell stories about neighbours being shot, about not feeling secure in the streets even during the day, about feeling insecure even in their own homes. A friend in Tactic, who usually teches spanish to tourists, tells me that she's out of work now since there are not to many tourists daring to stay here anymore. Another friend of mine told me about a man who got shot, probably because of drugs. But he didn't die but ended up in hospital instead. So the once who tried to kill him in the streets went to the hospital instead, asking for the family of the man. Of course they were all there. And so the band shot the whole family and then also the man they were aiming for in the first place. And the nurses could just watch and pray for their lifes to be saved. According to the Swedish embassy Guatemala has become more and more insecure just during the latest six months beacuse of the rising amount of drugs going through the country. More Mexicans and foreigners show up, but also a lot of locals get involved, some volontary, some forced to leave their land to the dealers. Worst case senario is that Guatemala will be completely controlled by the Mexican druggmaffia within two years. It might be hard, living in another reality, to understand how the drugtrade can easily destroy both people, families and a whole country. But all of you reading this are smart and educated people. You've got money. You've got knowledge. You've got power. So please, don't ever support the dirty industry of drugs! I've been out walking today. In the afternoon since it was raining like crazy the whole morning. It's still just great to be here! But when I walked the streets in the centre so many memories came back to me again. I went back to the tourist information where they still remember all the extranjeras by name, well almost. And I went to the hostel/restaurant/touristshop/tourist office where they have the best postres in town (chocolate cake for example;)) and they're always as friendly. But a lot of other memories came back to me as well, just like when I went here with bus the other day. I'll give you a list again. # Streetdogs. I met a couple of them today. I like animals in general, but I just can't like those dogs. I guess it's because of all the stories about them, because of the aggressivity and the diseases they carry around. 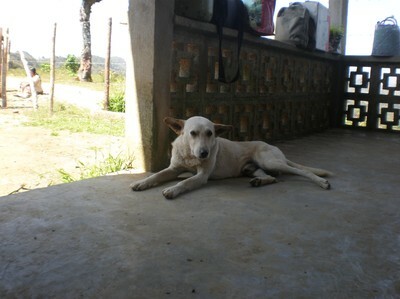 But the streetdogs of Cobán actually seemed nice today. # Internetcafés. They're everywhere now. Even in my neighbourhood! Times of globalization. # Paca, ropa americana. Packages of clothes sent from the states, new ones and 2 hand. Sold very cheap in small tiendas. My "brother" bought a t-shirt today, american eagle, for ten quetzales, more or less one dollar. Like new! # Shop assistants. They're so many!!! Sometimes the shops are even to small to make space for everyone working there. But they're always very nice and smiling. # The market. Those smells. Those colors. All this movement. It's something special for sure! # Trafic. It's just crazy. And smoggy. # Shoeshine boys, children selling fruit, children selling nuts. Children working all day. This a part I don't like, but can't change either. All I can do is to talk to them. And maybe buy some nuts. # Machetes and big guns. The man in the sidewalk, the guard ouside the bank. There are a lot of weapons around. # Churches. They are many. Some of them just in small houses in the middle of the city. Playing livemusic with the doors open to be able to share their missin to as many as possible. # And the food! Oh my, I'm gonna get fat! Almost three weeks with tortillas, beans, rice, pasta, eggs and potatoes. Beach 2009 here I come! Isn't it strange how home can be so far away from everything you know as your own world? Today I arrived home again. I always get the same warm feeling of welcome when the bus drives over the last part of the mountains from the south of Guatemala and into the green, rolling landscapes of Alta Verapaz. I will try to show you some photos later but I think it will be very hard to catch the real feeling for you anyway. I've been in Guatemala since Thursday night now (Friday morning Swedish time) but it feels like much longer. I've spent a couple of days with some great girls and women. Indigenous women, single mothers with well payed jobs. I've seen the rich part of Guatemala. The shopping malls (with cinemas and United Colors of Benetton), the gated communities (that are not very gated, but at least a bit more secure) and the culture of having lunch and dinner at McDonalds and TacoBell. Now I'm beginning something new. Also here in Cobán I'm staying with a well situated family with tv, internet and hot water in the shower. But the city here is small and with a majority of indigenous people. That means less trafic, a big mix of languages and a beautiful textile culture. It also means I can get closer to the marginalized people in another way than in the capital. There I couldn't even go through the poor areas with a locked car... I allready arranged a small "office" in my room and tomorrow I'll try to start "working". # There are roadbumps EVERYWHERE in the roads. And they're high, slim and made out of asphalt. Somehow, everytime you have to pass one you hold your breath, waiting for the car/bus to collapse. # The female mannequins in the shop-windows have HUGE asses, and they pose a bit more than the Swedish ones. # Frijoles, huevos and tortilla. Never forget that! Beans, eggs and (corn) tortillas made the Guatemalan way is just the best food in the world! # When you go by bus there will always be salesmen getting on and off, trying to sell you everything form food and drinks to sissors and strange medicine. # Along the high and winding roads there are a lot of memorial places to someone who died in any car accident. Isn't it just a wonderful country? Or really, I know both wonderful people and places in the US but the security-hype just takes the price! Maybe I should start with telling you all that I yesterday night, after about 24 hrs of travelling, arrived safely to Guatemala City and had a whole female committee waiting for me at the airport. Now I've been sleeping as if I was stoned the whole night and feel very happy to finally be here! Anyway, this blog is going to be about Guatemala, nothing else. Here, on the contrary, there's no security at all... And when we landed at the airport I happend to have a window seat. They guys working at the airport in Guatemala are not as old as in the US. I would say the youngest one taking care of our luggage wasn't older than ten years. How are their backs doing when their 25? Anyway, I got here, my bags got here. 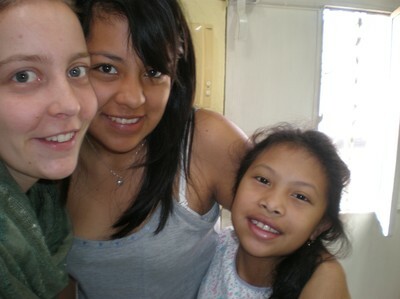 Now I'm having some lazy days with some nice girls here in Guatemala City before I head up to Coban to try to start my project. And Juan, I can't promise to be totally objective in this blog, that's not my aim. But I will describe what I experience, and how I see it, and I really apreciate all of you commenting (under "kommentarer") what I write and start a discussion if you want to. That'll just be developing for me! Ok, now it's breakfast time with Itza and Margarita. Hasta Luego! I've been trying to prepare my self for what I will meet in Guatemala. Friends there will get me at the airport when I arrive late at night and I do allready have a wonderful family to stay with up in the Highlands. But I will meet a new world I'm sure. To get to know women, some will probably be younger than me, allready mothers and with no man to support them. Single mothers depending on their family, or frineds, or work at times when the children sleep, or even childlabour. 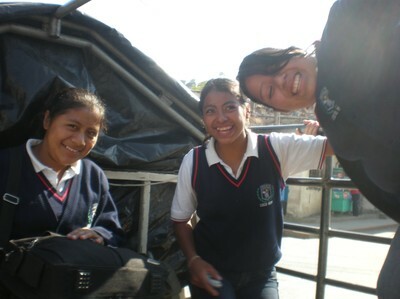 They say that Guatemala has become more and more insecure, especially the latest six months. A good friend of mine, who's soon going to Guatemala her self as peace observer, told me some people are even afraid of a new civil war breaking out. But I'm not to worried about those things. I trust in the Swedish embassy, I trust in people. I might still have a bit blue colour in my eye, but I just don't want to stop trusting in people. What do I have left if I don't have any trust? No, what I worry about is for me not being able to handle what I see and what I meet. I worry about me getting to involved or maybe even worse, not involved at all. I'm really looking forward to going now. Feels like I can't do nothing more here than wait. 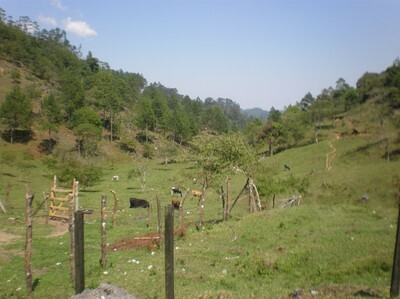 And Guatemala IS a beautiful country! I hope to be able to show that to you through this page as well. The beautiful country with landscapes reminding of a fairytale and with people and a culture of art that just makes you happy! Time to leave again. This time I will go back to the land of chocolatl and ik. To the land of beautiful landscapes and facinating culture. To the land of discriminated indigenous people and single mothers, las amas de casa. 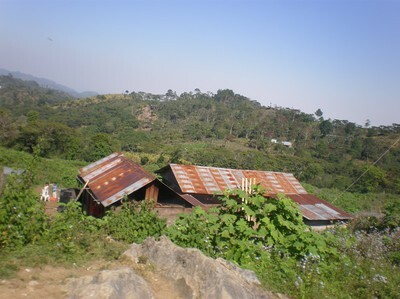 I will go back to Guatemala, to the highlands of Alta Verapaz, to write my thesis in Sociology. I will stay there for ten weeks trying to understand the life of the single mothers. Come travel with me and help me understand the world of caring mothers, absent fathers and a society of machismo. I will probably need you there!